Imari Ton-Ten-Ton Festival is held annually for 3 days from October 22 to 24 by Imari Shrine at Imari City in Saga Prefecture, Kyushu in the southeastern part of Japan. A lively mood prevails during the festival as the town fills with people who, dressed in festive clothes, dance in the streets and teams of men bravely carrying portable shrines. Imari Ton-Ten-Ton is well known as one of the three great fighting festivals of Japan. Its name comes from the sound of drum beats. They say that the pulse of a local person quickens when they merely hear a drum beating and they cannot keep still. 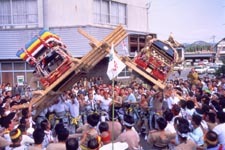 Dressed in the same outfits with bands of twisted cloth tied around their brows, groups of vigorous young men carry two portable shrines and strut through the streets. When the shrine-bearers encounter each other, they first enter into a shouting match. The drums, which have up then been beating slowly, sound three very high beats. This is the cue for the teams to run at each other, each crashing their shrine into the other. These shrines with which they are grappling each weigh 500 kg (1100 lbs.) and the struggle continues until one of the shrines is forced completely to the ground. Such valiant contests between shrine-bearers characterize fighting festivals and these clashes attract the greatest attention. During the festival such confrontations take place here and there in town, any number of times. The collisions are exceptionally dangerous and injuries are common. Often they are quite serious and an ambulance has to be called. In the climax of the festival on July 24, as evening falls, the ultimate battle, known as Kawaotoshi takes place. Presenting a magnificent spectacle, a pair of portable shrines clash and rush down into the river. The winning team is the one who first brings their shrine up to dry land. Achievement of this feat is thought to foretell good luck in the year to come.